The 1930s was the decade that transformed the character and importance of the Gulf in the twentieth century. It was the era when – from a British point of view – the region passed from a mere imperial conduit linking Britain to her Indian Empire, to a strategic oil producing region of vital importance to contending world powers against the backdrop of impending war. 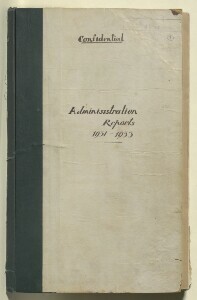 These changes, and the shifting British attitude to the region, are reflected in the annual administration reports produced for the Government of India by the Political Resident A senior ranking political representative (equivalent to a Consul General) from the diplomatic corps of the Government of India or one of its subordinate provincial governments, in charge of a Political Residency. in the Persian Gulf Historically used by the British to refer to the sea area between the Arabian Peninsula and Iran. Often referred to as The Gulf or the Arabian Gulf. and other senior British officials. 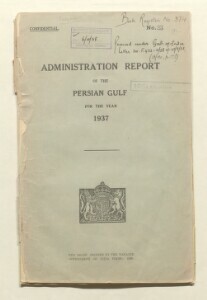 The Reports for the 1930s highlight four key areas of change in the region: air travel, oil, changing domestic power relations and the outbreak of the Second World War. The growing international importance of air travel in the 1930s is reflected in the development of the Gulf’s air routes. Already in 1932, the Political Resident A senior ranking political representative (equivalent to a Consul General) from the diplomatic corps of the Government of India or one of its subordinate provincial governments, in charge of a Political Residency. was highlighting the importance of the air route to India, which was making the Gulf ‘The Suez Canal of the Air’. In the mid-1920s there had been no air route at all on the Arabian side of the Gulf. But by 1937, the Arabian side was dominant, with Imperial Airways operating five services a week for passengers and mail, and the opening of an important new stopover at Sharjah. In fact, according to the Political Resident A senior ranking political representative (equivalent to a Consul General) from the diplomatic corps of the Government of India or one of its subordinate provincial governments, in charge of a Political Residency. , in ten years the Gulf had ‘changed from a cul-de-sac to a highway between East and West’. The biggest factor in the changing face of the Gulf was undoubtedly oil. Oil was discovered in Bahrain in 1932. By 1937, the completion of a new refinery saw Bahrain’s total oil production rise to just over one million tons, and twelve new tanks were added in 1939. In 1938, there were further oil discoveries in Kuwait and in Saudi territory at al-Hasa. In 1939, aerial reconnaissance started over the Trucial Coast The historic term used by the British to refer to the Gulf coast of Trucial Oman, now called United Arab Emirates. hinterland, while in Qatar drilling at ‘No. 1 well’ reached a depth of 5685 feet and yielded a ‘promising show of oil’. During the 1920s, Saudi Arabia had taken little interest in the Gulf Arab sheikhdoms: the discovery of oil changed all that as the Saudis began to think of expanding into the region. For the British the discovery of oil in their Gulf protectorates meant freedom from having to rely on Imperial Iran, under the newly established Pahlavi dynasty, for oil supplies – a key consideration in the event of war. The oil industry also brought about a large increase in the number of Europeans and Americans in Bahrain, from about only a dozen in 1926 to 300 in 1936. This, of course, brought about greater cultural and personal links between the Gulf and the West, particularly as the Gulf became strategically and economically invested in the political economy of the Western powers. However, the increasing economic importance of the region was accompanied by political unrest. 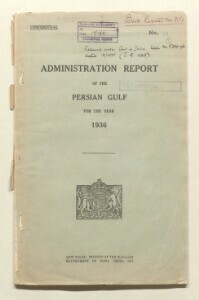 In what British officials saw as a ‘new and significant development’, in the late 1930s the peoples of a number of Gulf States began to make demands for a more representative form of government. This led, in 1939, to the setting up of nominated advisory councils following on from the Majlis Movement in Kuwait and a similar movement in 1938. 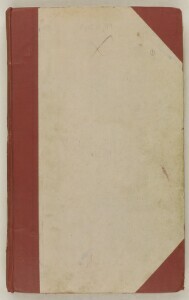 There was also agitation in Bahrain in 1938, which built on popular dissatisfaction with the Bahrain courts and the state education system, and was said to be nationalist in character. The unrest led to a strike among local employees of the Bahrain Petroleum Company (BAPCO) in protest at working conditions. However, the Report for 1938 plays down the unrest and notes that ‘the demonstrators were quickly dispersed and the strike failed’. The decade ended with the outbreak of war. Suddenly, Gulf rulers were in a position of importance in relation to contending international powers. The Gulf Sheikhs were quick to pledge their support to Britain, with the Sheikh of Bahrain donating £30,000 to the British war effort. However, in Iran, many army officers were pro-German. As international hostilities intensified, a rise in anti-British propaganda in the region led the BBC to commence daily broadcasts in Arabic, and committees formed by the Political Agents advised on how to popularise the broadcasts with Arab audiences. 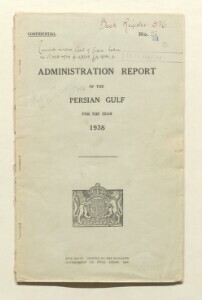 British counter propaganda efforts were assisted by a rise in the number of wireless sets in the Gulf – both privately-owned and those set up in coffee houses. Although undoubtedly the rise of the oil industry was the dominant factor, developing communications in the region – such as the BBC broadcasts and increased air travel – were also key indicators of rapid economic change. The advent of war would make the Gulf even more significant in economic terms, and, in a foretaste of what would happen in the 1970s, led to a realisation among both rulers and their people of the rising international importance of their homeland.